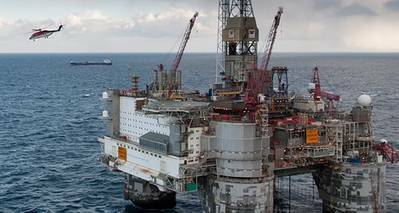 Statoil, on behalf of the licence owners, issued a Letter of Intent (LOI) to Samsung Heavy Industries for a permanent floating oil storage unit (FSU). The contract is worth an estimated US$ 230-million and includes options to buy two additional units. The new storage unit will replace the existing buoy loading system on the Heidrun field in the Norwegian Sea. The Heidrun field has been developed with a floating tension leg platform with a concrete hull and has been on stream since 1995. Oil from the field has since the start been exported via a buoy loading system consisting of two buoys and purpose-built shuttle tankers. The new FSU will be permanently connected to a buoy, and the oil will be lifted from the FSU by use of shuttle tankers. The FSU will be permanently manned and has an expected design life of 30 years.